My sister gave me this recipe years ago. I always make it around Thanksgiving and Christmas each year. The holidays just wouldn’t be the same without this recipe. 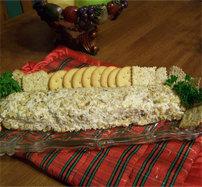 I know the ingredients may sound odd, but it has a wonderful flavor and it is usually the first cheese ball devoured at parties. Drain pineapple thoroughly by mashing it in the strainer until mostly dry. Reserve juice for another use. In a mixing bowl combine all ingredients except for nuts and mix thoroughly. Shape into ball or log and garnish if desired. Cover and refrigerate. This recipe tastes better if it is made the day before and chilled overnight in the refrigerator. It gives all the flavors time to marry. Serve with chips, crackers, cut carrot and celery sticks, whatever you like.